Jennifer Brooks Blog: New Vanity! Over the weekend I made a trip to Ikea to pick up a vanity desk for a early birthday gift while B and my dad built my vanity mirror. I'm sure most of you seen the Vanity Girl vanity set. I actually have been eyeing it for a few months now but never really built up enough courage to buy it. 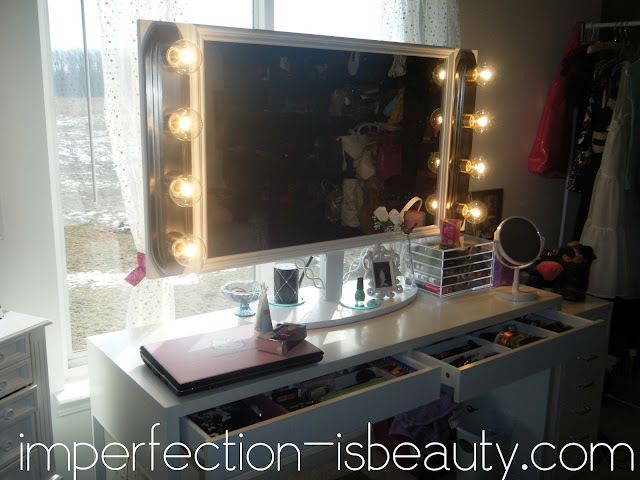 Its gorg don't get me wrong but $300 for a Mirror is a little redic, and the vanity's it sat on was not practical. I needed something bigger. I wanted something that I could blog and get ready at and if I wanted be able to have a girlfriend get ready with me. After browsing the last few months this is the conclusion we came up with. At first I was going to get this desk, and buy the vanity girl mirror table top, but B said it wouldn't be hard to make and considering my dad is a construction worker well this is what they came up with! It was beyond my expectations, and they totally went over board. lol I mean the mirror is the size of one of my televisions. I love it! Its perfect and I'm thrilled. They did a fabulous job! The total cost to build the mirror was under $100 but my dad also had majority of things.. The desk was bought at Ikea here's the same one. Very reasonable in price, and perfect to store and organize your makeup nicely. Their is two drawers on the desk which is even better to keep things all orderly. I also purchased the drawers at Ikea as well. As far as organization. I just got some drawer dividers acrylic cloth, and plastic. My brush holder is a few jars I got at hobby lobby. I also a wicker basket with my foundations, and primers that couldn't obviously fit in a drawer. I'm still in need of a nice upholstered chair, and more then likely another muji drawer but as of right now I couldn't be more excited. Perfect birthday present yet! Omg..Amazing!!! I love your vanity! I've always wanted a lighted mirror! 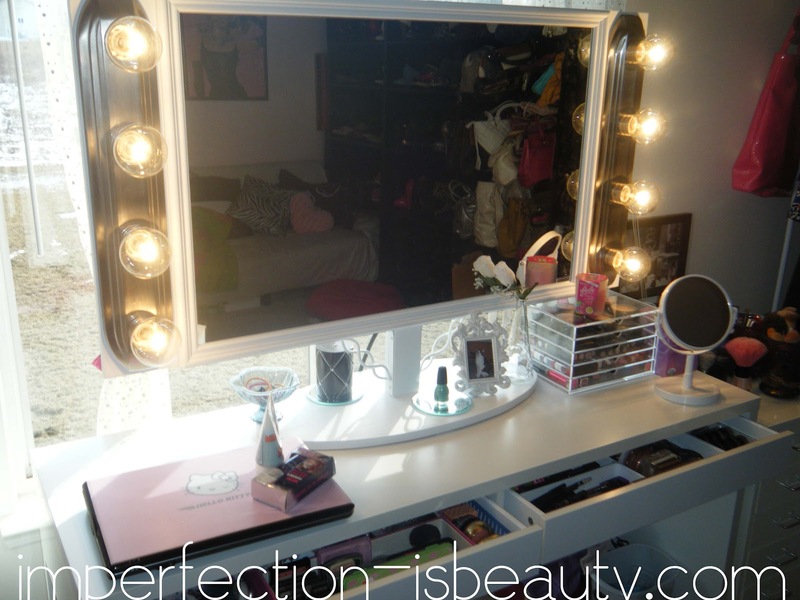 I want that vanity mirror so bad. Amazing set up, so cute! wow! jealous!!! i want something like that too!!! really a great set-up! love your huge mirror!!! 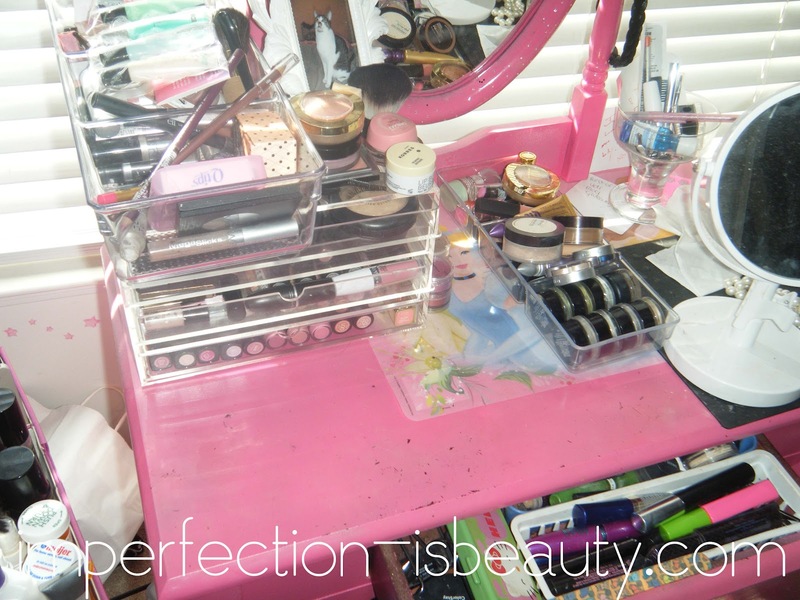 I LOVE the vanity set up!! I have been wanting better lighting for my vanity. Please let us know how the lighting works out. Love love love your setup! As soon as i move to a bigger house i am going to be going mad as i have always wanted one with the lights hehe. following you, i entered your contest and did the extra stuff. im ShimmerGlitzAndGlam on youtube. Cute vanity. I love it!! I love love love it!!!! My hubby wants to make me one too!! !